Post Form countertops are an economical countertop alternative that utilizes economies of scale to produce a functional standard product at competitive prices. They are a good countertop solution as long as the standard features of the product are kept in mind. Custom self-edge countertops are the proper choice when a degree of specialization is needed or there are non-standard requirements. Post Form laminate counters are generally rolled edge with or without backsplash & are manufactured in various factories and shipped as blanks of assorted lengths. These blanks are then cut to fit a particular job or home. While this is not a problem for many countertop jobs...changes in depths, large radii and pass through areas are generally impossible to achieve with reasonable quality expectations. 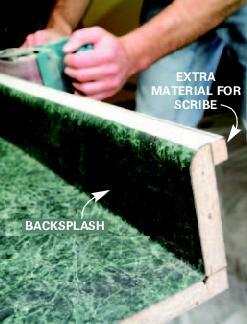 Post Form countertops are available in standard depths and lengths. Standard kitchen (24" Deep), vanity(21" Deep), and peninsula/island (generally 27", 30", 33", 36" or 42" Deep) depths are available. Royal Wood Design has access to a wide range of manufacturers and colors which include Formica, Wilsonart, Pionite, Arborite and Nevermar brand laminates. Each colour is available in different edge styles based on customer preference.